Keep your chain greased, because at least two more CicLAvias are in the works for 2016. CicLAvia is basically a block party that shuts down streets to motorized traffic and encourages folks to bike, walk and skate through the roads. The next event is scheduled for October 18 in "Heart of L.A." (running from MacArthur Park to Hollenbeck Park, through downtown), but officials and organizers already have their eyes set on two more routes for next year, with plans to hit the streets of the Valley again and also in the Southeast L.A/Watts area. A memo, dug up by CiclaValley, a community organization on cycling in the Valley, reveals that city officials have discussed the Van Nuys/Pacoima neighborhood as CicLAvia&apos;s site in March of 2016. "You would have to imagine that it would largely include Van Nuys Blvd.," writes CiclaValley, "and seeing how no CicLAvia has ever crossed a Metro Line at-grade, it would have to take place north of the Orange Line, just above Oxnard." And while no Metro rail serves this part of town, it would be the first with access to Metrolink on its route they add. 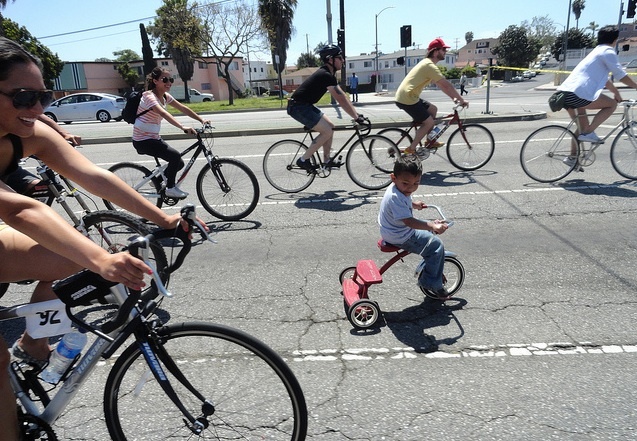 The other CicLAvia, scheduled for May 15, will go through Watts and include the cities in the southeastern part of the county. While no route has been revealed for that event either, presumably they&apos;ve figured out the hassles of organizing around several different cities (Huntington Park, Lynwood, South Gate, and of course L.A. itself) and their particular logistics. It&apos;s probably safe to assume that the Watts Towers will be one of the hubs. Hopefully no taco restaurants will be harmed in the organization of these CicLAvias.